1 Pre-heat oven to 220°C. Line a baking tray with parchment paper. 2 Oil each side of the beef & season with salt. Heat oil in a pan over medium-high heat. Add the filets and sear for 1 minute each side. Cool then refrigerate for 30 minutes. 3 Heat olive oil in a pan over medium-high heat. Add the shallots and garlic, and cook for 1 minute, then add the mushrooms, salt and pepper, and cook, stirring often, until the mushrooms are dry and beginning to brown. Transfer to bowl & cool completely. Mix mayonnaise through mushroom mix. 4 Roll out the puff pastry on a lightly floured board into 2 equal-sized, 18cm squares. Take the seared filets out of the refrigerator, dry juices with a paper towel, brush with Colman’s mustard and press mushroom mix on top of each steak. 5 Lay each steak, mushroom-side down on a puff pastry square and top with a thin layer of mushrooms. Using a pastry brush, brush the egg-wash along the edges of the pastry square. Fold one side of the pastry, press down, then fold the adjacent side, and press down. Press together the other two sides, sealing the pastry. Put the Wellington, seal-side-down on the tray. Do the same for the other wellington. 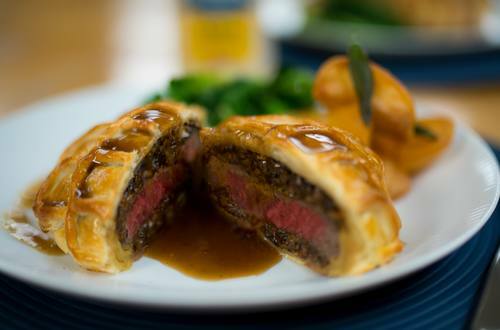 6 Brush the egg-wash over the top and sides of each wellington, and decorate using excess pastry (optional). Place the tray into the oven, and bake 20 minutes, until the pastry is golden-brown. Remove the tray from the oven, and let the Wellingtons rest 5 minutes.